Each Status Update you post can be used to let your users know what is going on with your site. You can have users subscribe to you so that they get notifications via email whenever a new update is available. Status Checker is also very secure! Captcha enabled registration page to prevent bots from spamming your site (can be disabled in Admin Panel). Can use native captcha or Google reCaptcha. Post updates about your site using the in-built text editor to create HTML rich updates. Each update has a status set to it: Unresolved, In Progress or Fixed. You can post updates to each thread so that you can keep users informed. Subscribers are notified each time there is a new update posted via email. Can disable subscribers via Admin Panel. Sticky important updates to the top of the page. Force a user to be logged in in order to subscribe. Add unlimited amount of sites to check to see if they are working. Test a site’s response by HTTP Code, a random string or JSON Object. Includes cron file that you can run to check all sites at a specific interval. Can manually check each individual site. Frontpage will show the status of each site. Checks are made by Cron so it doesn’t spam sites. Enable Twitter Feed on your frontpage to show the most recent tweets from a Twitter Account. Can be disabled in Admin Panel. 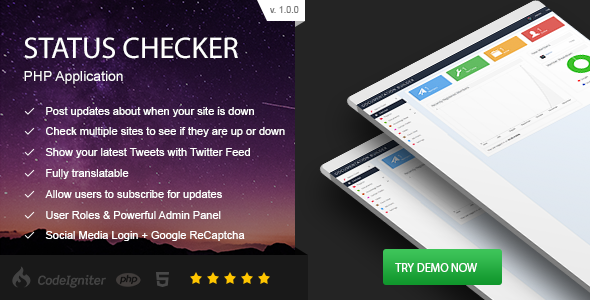 A specially designed page that allows a user to view the Status Checker. Lists all sites listed in the Site Checker. Subscribe button for subscribing for updates. Change site name, logo, layout and other settings. User Roles allow you to create specific permissions for your users. Roles include Admin, Site Checker Manager, Status Manager and more. Subscribers allow you to view all the users that have subscribed to your site. Requires PHP 5.4, PHP CURL Library and a MySQL database.